Hackle: furnace brown Tie relatively sparsely; see picture. 1. Cut, stack, and tie in a shank-length pinch of calftail, with butts coming half-way up the hook. Cover butts. 2. Cut, stack, and tie in a pinch of calftail (a little longer and enough for both wings). Butts should meet tail butts Leave 1/8th inch of space behind eye. Cover butts and wrap back and forth over both sets for smooth underbody. 3. Bring thread to front, hold up wing, and wind to build up a tapered wall to hold it ut. 4. Divide wings by pulling half the calftail to each side. X-wrap the wings several times. Then make several figure 8s from the front—never go under the shank. Finally, wrap the base of each wing and wind thread back to tail. 5. Dub a thin noodle of yellow rabbit for body—leaving 1/8th inch of space for wing. 6. Select 2 hackle the proper size, marry them concave side to concave side. Wind 4 times behind wings. 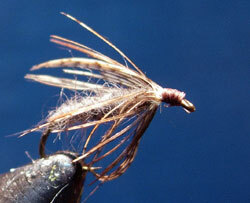 “Skip” hackle (slide under) wings and wind 2 twice in front of wing. 7. Hold hackle back and tie down. Whip finish. Add head cement. With weight, cast across stream; it will rise as you retreive and look like a rising emerger. It may also be tied without weight and fished on the surface. 4. Stack a pinch of calftail after removing the fuzz. Cut slightly longer than the hook shank. Put a drop of head cement on the base of the butts. 6. Select a proper-sized Hungarian Partridge covert. Pull off fuzzy part. Select 1/4 inch chevron by pinching together the barbules above it. Tie in a little above the chevron. Grasp hackle in hackle pliers and hold straight up. Force back barbules. Wind, tie off, whip finish. Add head cement. 2. Select a proper-sized Hungarian Partridge covert. Pull off fuzzy part. Select 1/4 inch chevron by pinching together the barbules above it. Tie in a little above the chevron. 3. Grasp hackle in hackle pliers and hold straight up. Force back barbules. Wind, tie off, whip finish. Add head cement.